Harley-Davidson, Inc. is an American motorcycle manufacturer, started by William S. Harley, Arthur Davidson, Walter Davidson, and William A. Davidson in 1903. It was founded in Milwaukee, Wisconsin and was one of two major American motorcycle manufacturers to survive the Great Depression. 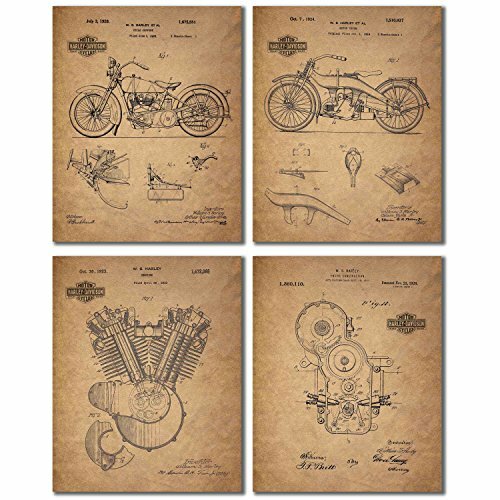 Any Harley Davidson fan knows the quality of their product and would be delighted to own these unique patent photos that will look fabulous as framed decorative wall art. The engine construction patented on Nov. 23, 1920 was created to improve the already successful Harley-Davidson engine. The principal of the invention was to improve the internal combustion engine structure, particularly that type of engine adapted for use on motorcycles. The 1923 Harley Davidson engine patented on Oct. 30 shows that Harley is always improving. This particular engine was designed to ensure regular operation of the engine irrespective of the temperature at which the engine is operated. As well as to provide a motor in which the errors of timing of the mechanism due to expansion of the parts are eliminated. This motorcycle patented on Oct. 7, 1924 was designed to improve the frame. This invention is designed to overcome defects, and to produce a motor-cycle of improved characteristics. One of the objects of this invention is to simplify the construction of seamless steel tubing motor-cycle frames. This cycle support was invented in July 3, 1928 as an improvement to the kickstand. It was designed so that you were able to park your motorcycle with more ease while keeping it unobtrusive in appearance. Premium grade photo paper in a rich gloss finish. 100 year archival rating, designed for a lifetime of enjoyment. If you have any questions about this product by BigWig Photos, contact us by completing and submitting the form below. If you are looking for a specif part number, please include it with your message.